Henry Maudslay (1771-1831) was apprenticed to Joseph Bramah (lock maker and inventor of the hydraulic press) but soon became his foreman. Maudslay invented the self tightening leather collar that sealed the pistons of Bramah’s hydraulic press making it watertight. He also designed and greatly improved the machine tools used to make the locks. 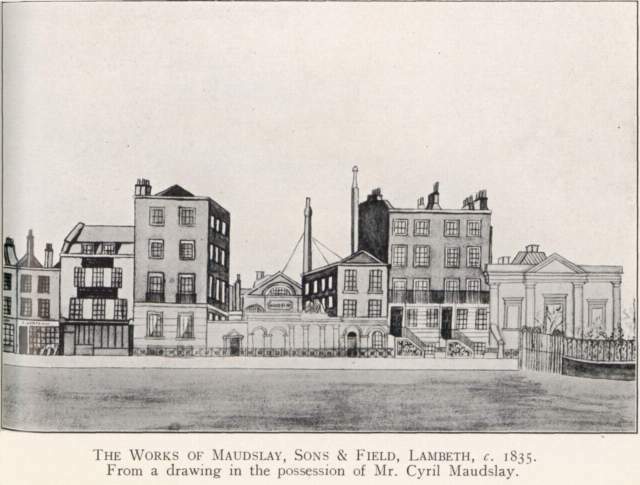 Maudslay fell out with Bramah over pay and in 1797 set up his own workshop in Wells Street (off Oxford Street) making precision machinery. Here he invented the ‘slide rest’ which let the tool rest slide the length of a lathe and be accurately set simply by using a handle. Later he devised a method of moving the rest by turning a handle. This meant that a tool could be clamped in the rest and moved smoothly along the length of the work greatly improving accuracy and quality of the finished goods. This method was widely used in many of Maudslay’s self-acting and self-regulating machine tools. He further improved the lathe by adding steam power which meant that large metal pieces could be worked very quickly and accurately. 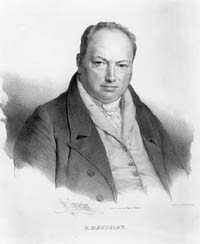 Maudslay’s first major contact was for the 42 woodworking machines, powered by one 32 horse power steam engine, used by Sir Mark Brunel’s block making factory. The blocks were used in the rigging of sailing ships, a single 74 gun Royal Navy ship needed some 1,400 blocks of various sizes. Overall the navy needed 160,000 blocks (of various sizes) per year which were individually hand-made by a workforce of 110 men at a cost of more than £541,000. The machine-made blocks were made to higher standards, with greater accuracy, more quickly and much cheaper than before. By using Maudslay’s machines, Brunel was able to cut his workforce to 10 men and saved the navy many tens of thousands of pounds per year. Maudslay’s work for Brunel brought him fame and soon he was making machinery for other factories, which led him to require larger premises. He obtained a 999 year lease on some ground in Westminster Road, Lambeth, built a new factory and moved there in 1810. Throughout his life Maudslay recognised the need for standardisation in making goods of all sorts. He improved the micrometer, by a factor of ten, so that it was capable of accurately measuring down to 0.0001 inch. He improved screw cutting lathes capable of making accurate standard threads (prior to this each screw thread was individually turned). Whitworth, who was Maudslay’s apprentice, further developed the concept of standard screw threads which soon became the de facto British standard. Maudslay invented a new type of slide rule (the early analogue computer used by engineers and mathematicians for multiplying and dividing numbers). Maudslay is also the inventor of a method of desalinating seawater for marine boilers and a method of printing on calico. The company also manufactured equipment for flour mills and saw mills, and minting equipment. The range and quality of its products made the company an excellent breeding ground for great engineers. Richard Roberts (planing machine), Joseph Clement (water tap), James Nasmyth (steam hammer) as well as Whitworth were all apprenticed to the company. Maudslay, Sons & Field (Maudslay’s company) developed marine steam engines and stationary engines (as used in water pumping stations). Brunel’s SS Great Western was fitted with two side lever engines and four flue type boilers made and installed in Lambeth by Maudslay, Sons & Field in 1837-8.